The dynamics of today’s market and how companies reach consumers is shifting. As the newest generation of buyers, millennials continue to gain purchasing power, and the market has adapted to their interests and buying habits. Millennials, unlike generations before them, spend more time shopping online and less time in stores, stream their TV and skip through commercials, and value experiences over possessions. A recent study by the Event Marketing Institute shows that 74% of event participants have a more positive opinion about a company, brand, product or service being promoted after participating in an event. So, to address the new market dynamics, implementing Experiential marketing in your marketing mix is quickly becoming a necessity. The question is no longer if you should be doing experiential, but how. If you’re new to the game, these five important keys-to-success will get you started. In the past, Experiential marketing campaigns tended to be the result of excess advertising dollars and were executed with a lack of planning and accountability. As Experiential marketing year-over-year is occupying a bigger portion of advertisers’ marketing dollars and becomes more prevalent, and to ensure you start off on the right foot, it’s important to be honest about your objective and determine what you’re trying to accomplish with your campaign. Is the goal of your campaign to generate leads? To create positive associations with your brand? To increase social media engagement? To gather information about a key demographic? To surprise and delight consumers with a free treat? To launch a new product or promote a grand opening? Defining the objectives of each campaign and being clear about them will allow for a campaign with elements tailored specifically to help you achieve your goals. 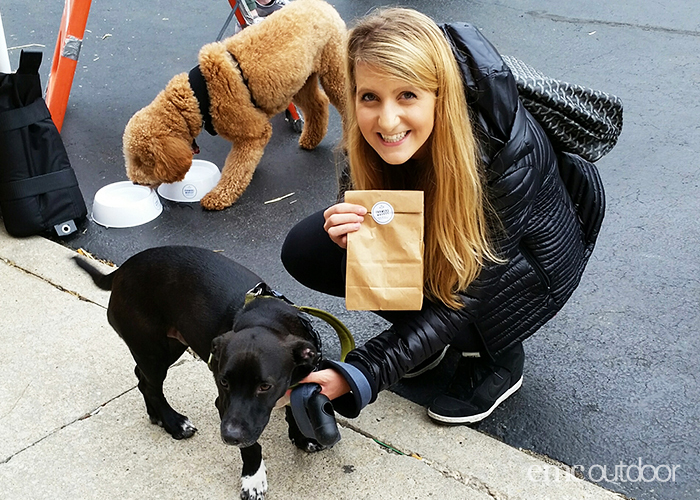 Experiential campaigns come in all different shapes and sizes. It’s important to clearly establish your budget and goals to help inform what campaign is the right fit for your brand. According to findings by the brand experience agency, Freeman, and data company, SSI, one in three CMOs is expected to allocate between 21 percent and 50 percent of their budget to brand experience marketing over the next three to five years. With so many brands recognizing that Experiential marketing is a vital part of the marketing mix, it is becoming more important to identify a clear path to measuring success. An understanding of your budget and goals will help you or your agency partners chart the best path to a successful campaign. Being realistic with your expectations is equally important so you can have a meaningful impact with an actionable outcome. Whether your budget is $50,000 or $500,000, creative solutions can be thought up at any budget and can achieve your marketing goals. 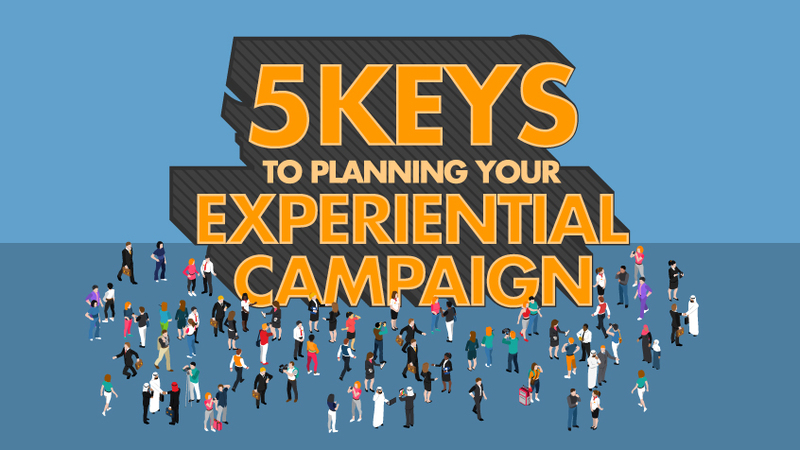 Developing a plan for activating your experiential campaign must fit into the rest of your marketing strategy. An experiential campaign should not just be a standalone element of your marketing, but rather a piece that fits into the larger puzzle that is your integrated marketing plan. Each element of your marketing campaign, from experiential to OOH advertising to television commercials, should all work together to convey a consistent message to your target audience. Creating synergy between the different elements and repetition of the brand’s message and core values is key to resonating in consumers’ minds. Consider a commuter who gets off her bus and engages in an experiential activation on the way to work. It might take several of these instances for the brand message to resonate with her. However, if this same commuter sees a poster on the interior of her bus, a billboard along the bus route, a funny commercial while watching her favorite show on a mobile device, then engages with smiling, friendly brand ambassadors at an event footprint on her way to work, the brand has succeeded in reaching her at numerous touch points. The result is a brand message that stays at the top of the consumer’s mind. Few brands have illustrated the importance of utilizing every element of its media mix to resonate with consumer’s than Coca-Cola. Through its famous “Share a Coke” campaign they brought numerous elements together and created good will among its target consumers by encouraging them to share a can of soda with their friend. They brilliantly integrated OOH, experiential, social and television advertising to deliver the same consistent brand message—that a Coke is an experience meant to be shared. The company used a website where people customize coke cans to share, billboards around the world, TV spots showing the good will that’s generated by sharing a coke, and experiential pop ups where people could customize coke cans on the spot. Overall the campaign generated 25 million new followers on social media, countless impressions, and increased sales volume for the first time since 2000 (adage.com/article/cmo-strategy/coke-adding-names-share-a-coke/308678). Coca-Cola’s integration of experiential marketing in the greater strategy made the “Share a Coke” campaign a success, but not just by the numbers. Coca-Cola also succeeded in creating positive emotions in and a connection with consumers. Maya Angelou once said, “People will forget what you said, people will forget what you did, but they’ll never forget how you made them feel.” This remains true when it comes to experiential marketing. 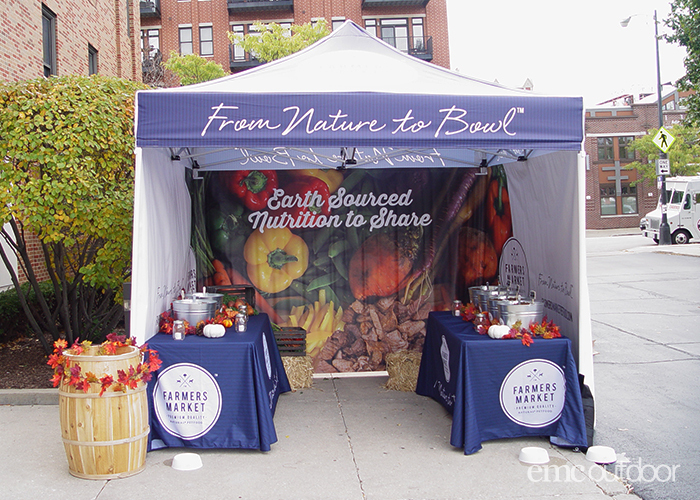 Experiential marketing is about creating connections and eliciting feelings from your target consumer audience, so it’s important to also consider what feelings you are trying to associate with your brand. A poorly planned campaign can leave consumers with the wrong message and in turn lead to negative associations with your brand. In a study conducted by AgencyAE 93% of consumers found that they were more connected to a brand after an experience and 94% say they are more likely to remember a brand after an experience. This is due, by and large, to the feelings that experiential campaigns elicit in consumers. 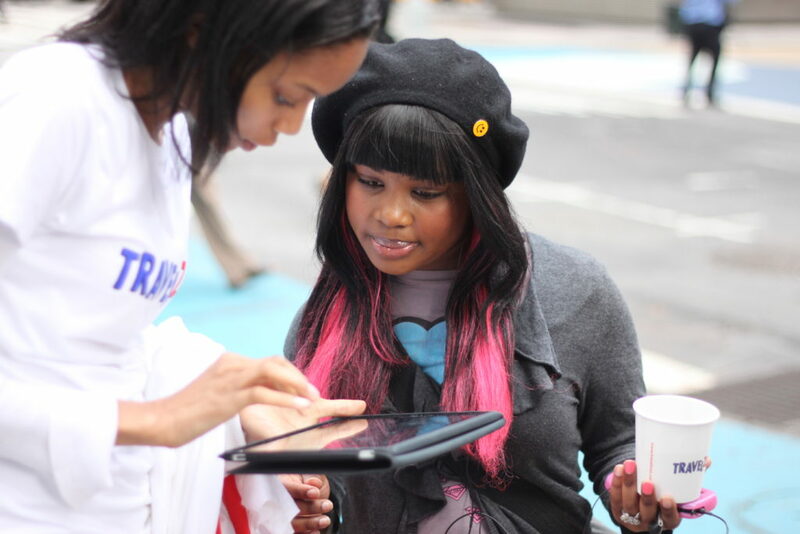 An experiential campaign can accomplish in a few seconds what other mediums can never achieve: a one-to-one personal connection with a brand. Think of an experiential campaign as your very own living, breathing commercial except instead of being a one-way channel it becomes a two-way conversation between the brand and consumer. Creating a feeling through your brand experience makes a conversation much more meaningful. Technology should be a cornerstone to any experiential marketing plan. Whether you are utilizing tablets for lead generation, creating a VR/AR experience, offering a social media kiosk or photo booth, encouraging app downloads, or tracking interactions with your event and providing calls to action to encourage behavior by syncing guests’ mobile devices while at your event, there are myriad ways to introduce technology as a component. According to a recent article by Chief Marketer, leveraging technology at an event has been shown to increase attendance by 20 percent and productivity by 27 percent, while decreasing costs up to 30 percent (www.chiefmarketer.com/integrate-experiential-larger-business-strategy). To put it simply, leveraging technology allows for more efficiency, more interest, and more trackability by giving access to important KPIs and data that are invaluable to your brand. One of the easiest and most cost-effective ways to incorporate technology to your experiential campaign is through social media integration. Utilizing hashtags, Facebook and Instagram live video, social media connected photo booths, giveaways for unique engagement, or requiring people who engage with your footprint to integrate their accounts with your brand, are all effective ways to make your campaign more social-friendly (and trackable!). Social media invites consumers to create content for your brand and to share that content to their entire network, inviting anyone who interacts with the footprint to become a brand advocate while providing your company with invaluable data. From there, the options for more complex technology integrations are nearly endless and can be quite elaborate, like creating a VR experience or utilizing 3D projection mapping to create an immersive setting. Technology at the right scale is invaluable for your brand and your message. The point of the experiential marketing endeavor is to leave a lasting impact and build meaningful connections with your target audiences. Successful experiential campaigns can be tailored to fit your unique need, but you must start with the basics: clearly defining your objective, budget and goals. From there, the possibilities for amplifying your message and elevating the experience for your consumers is limitless and depends on how well you integrate it with your marketing mix and implement technology to create the most interesting and efficient experience. 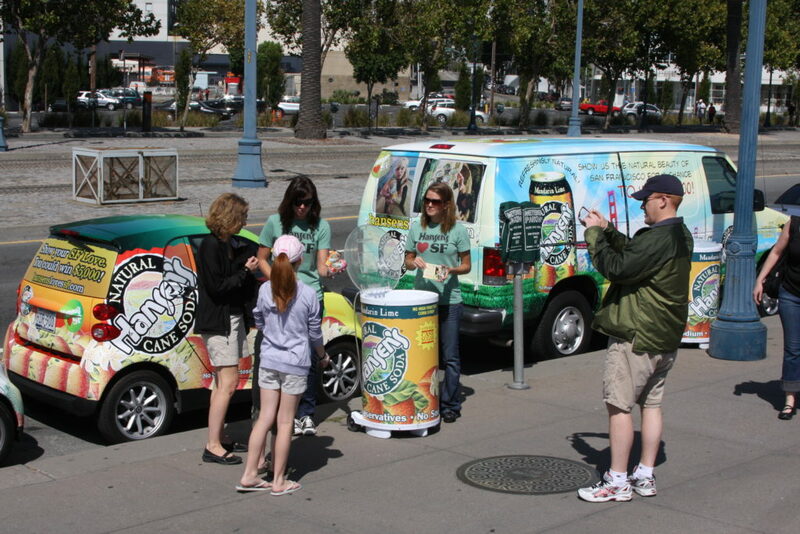 Are you thinking about furthering your experiential marketing and OOH efforts? Reach out to EMC Outdoor, your partners in building an integrated marketing plan for whatever goals you’re looking to accomplish. 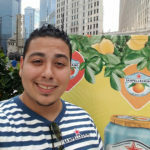 Keith Hernandez, Event Specialist, and newest member of the EMC Events team, has specialized in nontraditional Out of Home and Experiential marketing for the past five years. He has a passion for seeking new experiences in his personal life and creating unique experiences for brands and consumer’s alike.